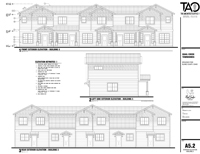 Following approval by the Blaine County commissioners on Tuesday, ARCH Community Housing Trust is set to proceed with construction of a 26-unit rental-housing project near The Meadows trailer park south of Ketchum. The target completion date is fall 2015. The Ketchum-based nonprofit plans to build its price-restricted Quail Creek Townhomes on about two acres of donated land adjacent to state Highway 75 just north of Cold Springs Drive. It will have eight one-bedroom units, eight two-bedroom units and 10 three-bedroom units. The approval came despite legal and design objections raised by neighbor Michael Engl, expressed by attorney Fritz Haemmerle at a commissioners meeting May 6. Haemmerle contested the legality of the land donation, made by Quail Creek LLC, a developer connected to The Meadows and owner of a failed project there that was to include 87 free-market homes and 39 community-housing units. On April 29, the commissioners approved an amendment to Quail Creek’s planned-unit development agreement that allowed it to make the donation instead of building the community-housing units. Haemmerle contended that the change could not be made now that building permits have been issued for some of the Quail Creek units. He also said the passage of a three-year deadline for Quail Creek to record its final plat nullified its agreement with ARCH to donate the land. During the May 6 meeting, county Deputy Prosecuting Attorney Tim Graves said the donation issue had been dealt with during the April 29 hearing, and on Tuesday, he dismissed the plat deadline question as well. “This is a new development, so presumably new timing and phasing will apply,” he said. At the conclusion of the meeting, Haemmerle said he will appeal the decision. In an interview, ARCH Executive Director Michelle Griffith said the organization will proceed with its construction plans despite the threat of a court appeal. She said she hopes construction can begin in late summer or fall. “We intend to continue right through the winter,” she said. Before that can occur, however, Quail Creek will need to obtain subdivision approval from the county commissioners to break off the 2.1-acre parcel. County Land Use and Building Services Director Tom Bergin said Wednesday that only a partial application had been received from Quail Creek. During the May 6 meeting, Griffith said that with its mix of apartment sizes, the development will better serve Blaine County’s housing needs than would the original plan to build 39 three-bedroom units. “We were able to serve more households with the same impact to the community,” she said. The project is funded by more than $6 million in federal grants.